We all do it. We all forget. We forget to turn our headlights off, close the gas cap, or take our coffee off the top of the car before driving off. Sometimes those mind slips can be funny…other times they can be outright disastrous. 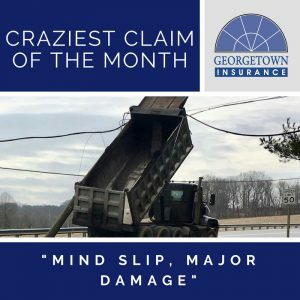 In this month’s craziest claim, one tiny forgetful incident led to widespread damage. After dropping off some material at a job site, one of our client’s drivers pulled out of the lot to leave and started driving down the road. Suddenly, he came to a screeching halt as his truck bed slammed into the high power lines above. The impact caused the pole to break in half, damaging another car and injuring both the truck driver and driver of the other car. How in the world did this happen? The driver simply forgot to disengage the Power Takeoff Unit as he hit the road, triggering the bed to go up as he was driving down the road.